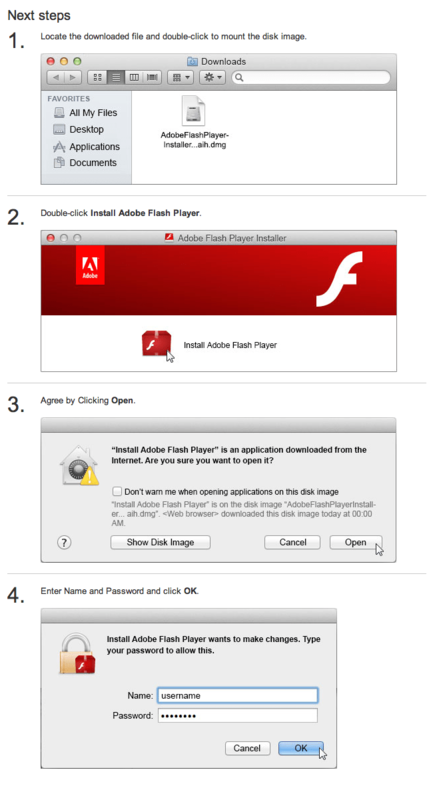 On the final page of the Flash Player download process on Adobe’s website, they offer a series of helpful screenshots to guide the most novice of Mac users through the process of locating and running the installer. Only… no, wait. Those can’t be real Mac OS X screenshots. The fonts are all wrong! So is the anti-aliasing, if you want to get really geeky about it. They’re mostly Arial, with the trademark overly-hinted anti-aliasing of Windows. Strangely though, it looks like the text label under the disk icon in the first screenshot is in Helvetica. I have come to expect subpar user experiences from Adobe, a company whose products I once loved so dearly. But this really takes the cake. I can’t even quite comprehend how screenshots like these were produced. It’s impossible to get results like this on a real Mac. Do they have some weird proprietary in-house Mac emulator that runs on Windows? (Actually, that might explain a lot.) Did they actually meticulously create these “screenshots” in (the Windows version of) Photoshop? Or do they have a Windows application specifically designed to generate fake Mac screenshots for all of their documentation? I’m at a loss to explain it, but there’s no way it wasn’t significantly more work than simply, you know, taking screenshots on a real Mac.